Travel Family 'Round The World G’Day Sydney! After looking out the window on Thursday morning, we weren’t sure how much sightseeing we would be able to accomplish because of the weather. The one thing we needed to do before anything else was return the rental car. Believe me, the last thing I wanted to do after the drama on Wednesday evening was drive again in the city, but what choice did I have? Before leaving the hotel, I located the rental car office on a map, but was sure that dropping the car off wouldn’t be as simple as it appeared. Once we were out on Sydney’s busy streets my suspicions proved correct as the rental car agency was tricky to get to. The office, while addressed on a major street, had to be approached from a small one way street behind it. Once I figured this out, I had already passed this street, so as soon as possible I turned left so that I could turn around and make my way back. Unfortunately, I soon found myself on the entrance to one of tunnels that run under the city. By the time I was able to exit from the tunnel a few kilometers down the road, we were quite far from the Hertz location. Luckily we emerged in a spot I had driven through on Wednesday and I was able to navigate my way back to Hertz. The second time I didn’t miss the small turn off and we finally got the car back safely. At this point our day hadn’t yet even started and I wanted to put my head between my legs in a ball and cry. (Perhaps a small exaggeration!) The only thing that put a smile on my face at this point was the realization that I wasn’t going to have to drive in Sydney anymore! Ok, I embellished a little again. I was really smiling because we were in Sydney. Sydney is one of many places that I have always wanted to visit. Since Hyde Park was adjacent to the Hertz, we began our Sydney adventure there, taking a picture in front of a fountain and then making our way to the New South Wales Art Gallery. In approaching the art gallery we had high hopes. In fact, the gallery itself contains plenty of wonderful art, but nothing truly unique and we only spent around a half an hour in its corridors. I think our disinterest stemmed from a combination of us visiting so many art galleries in the past ten months and the fact that we were so close to our first view of the Sydney Opera House. Before we could reach said opera house, we walked past the Hyde Park Barracks museum and took a tour of the New South Wales Parliament House. 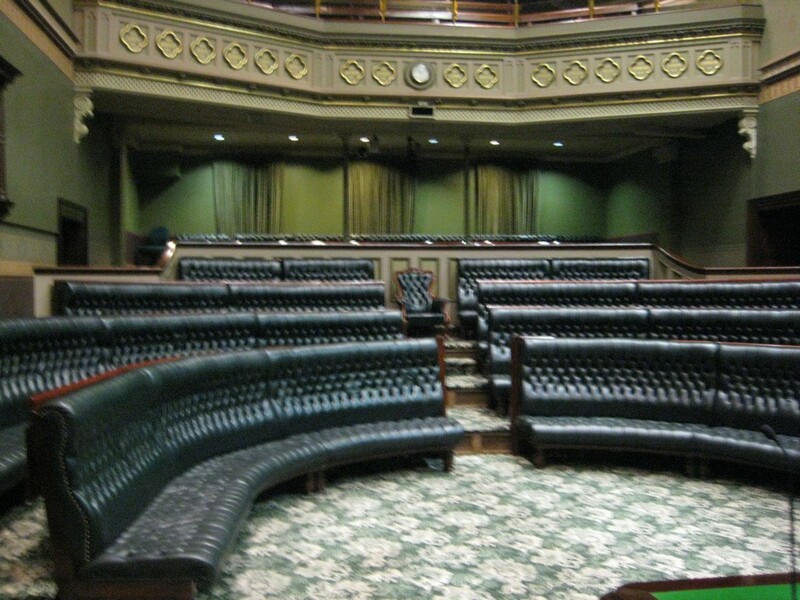 The NSW Parliament House turned out to be much the same as the Parliament House in Canberra. After being allowed to wander around the common areas for a few minutes, when enough people had gathered, we were given a tour of both the upper and lower houses which were dressed in the traditional red and green. While we didn’t see anything truly spectacular, it was a nice diversion. After leaving the NSW Parliament House we didn’t have anything in between us and the opera house except for the Botanical Gardens. To be honest, we didn’t really stop to smell the roses and proceeded past a children’s play and directly to the shore. Just before reaching said shore, through the trees in the distance we finally saw the marvelous Sydney Opera House and Sydney Harbour Bridge. Before we could make our way to the Opera House, we wandered out to Mrs. Macquarie’s Chair which sits sticking out on a point in the harbor. The spot is named after one of the former governor’s wives who used to sit there and stare out at the harbor. From Mrs. Macquarie’s Chair, we took several more pictures of the harbor and skyline and then made our way along the waterfront, through the almost endless number of runners to the Opera House. The walk from Mrs. Macquarie’s Chair to the Opera House took around 10 minutes and was wonderful even given the weather. Since we have six days to explore Sydney, we opted not to tour the Opera House today. Instead, after marveling at the building, we took a few pictures on the steps and then proceeded to walk through the main ferry terminal, Circular Quay on our way to the Rocks District. The Rocks District is the oldest part of Sydney and home of the spot where the first British settlers landed in Australia. As expected, The Rocks is rich with history and has several interesting buildings and a charm not found anywhere else in the city. This area is also dominated by the Harbour Bridge as it towers overhead on its way into the city. While walking around the area, we passed under the bridge several times. During most of the day we fought the weather as it rained off and on. As we finished walking around the Rocks District, the rain started coming down in droves. This, combined with the fact that it was almost 2:30pm and that we still hadn’t eaten lunch, led to us all being a little cranky. Since all of the restaurants in the Rocks District were touristy and out of our price range, we began the thirty minute walk back to our hotel with the hopes that we would find a suitable place to eat along the way. The one thing that Australia certainly has a surplus of is food courts and luckily we found a decent one on our way back to the hotel. The food court was located in the basement of an office building and was only open for lunch to cater to the workers. Since it was just minutes before their closing, several of the shops had food at good discounts and we were able to score three salads for a very good price. Before long, the leafy meals were in our bellies and we were back on our way. By the time we finished lunch, the rain had slowed down a bit and the walk back to the hotel was bearable. From the food court we walked through the Darling Harbour area. Even though it was still wet, Shawn Reece found a brief distraction in a playground, before we were forced to move on because of the rain. Darling Harbour was home to a lot of the activities during the Olympics and seemed like a nice place, but the rain worsened once again and we were forced to leave it for another day. We finally returned to our hotel around 3:30pm and the weather forced us to stay inside for the rest of the night. We have so many places planned to visit during our six days in Sydney, but the weather may dictate otherwise, since the forecast doesn’t look very good for the rest of our time here. At this point, all we can do is pray that sunny days will return. On a good note, we found a wonderful Food Court next to our hotel in Chinatown. While the day was a mixed bag, just seeing the Opera House was enough for me to call it a success. Previous articleMaking Our Way To Sydney! Next articleMore Rain In Sydney! Hello to the 3 wandering Coomer’s. I don’t know if you knew this or not. But Apryl had a baby boy on October 12. His name is Kingston Rocco Monte. He is beautiful and your dad has seen him a couple of times. In fact David and Gloria saw both of them in the hospital before they came home. I talked with Apryl a couple of days ago and Kingston at 6 months old now weighs 22-lbs and 28″ long. Big boy. So maybe when you get back to the States you could find your way to Lakewood Ca and stop and see your sister, and niece and nephew. Australia has always been a place that I wanted to visit someday. There is nothing like experiencing it yourself. Yes I am sure that some things seem same-o-same-o. But you will remember it always. What an adventure for Shawn Reece. He will have a passport stamped with exotic places and seen things that all of us could only dream of. Cambodia, I think your dad has been there. You’ll have to ask him. Do you have an itenery for the rest of your around the world trip. Take care of yoursleves and remember we all love you and want you to be safe and happy.